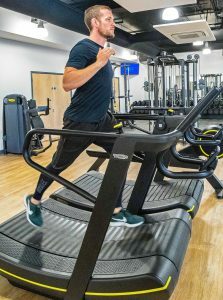 WOKING Sportsbox, the latest fitness facility in the town, has opened with a gym, sports hall, studios, athletics track, multi-use games areas, 3G and grass football pitches. The 80-station gym is compatible with the TechnogGym Wellness System, which has been described as being a bit like a personal trainer on your phone. The app guides users through a programme from exercise to exercise with a video to follow and provides a record of progress. Freedom Leisure general manager Geo Castro described the Sportsbox is as a “high-end yet affordable leisure facility for the whole of the Woking community”.